Each year one out of every three adults aged 65 and older experiences a fall, according to the Centers for Disease Control and Prevention. Falls are the leading cause of both fatal and nonfatal injuries among elderly adults. These shocking statistics put into perspective the importance of reducing fall hazards and keeping seniors safe. 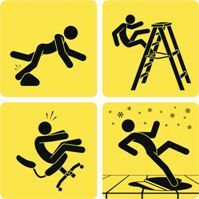 Where do most falls occur? Research shows the majority of falls happen in the home. For seniors, falling at home can be a frightening experience, especially if they live alone. Fortunately, reducing risks and creating a safer home environment can be simple by following five fall-proofing recommendations, courtesy of the American Academy of Orthopaedic Surgeons. Learn more by visiting orthoinfo.org/falls. Use a bed that is easy to get in and out of to reduce the risk of falls in the bedroom. Select comforters and sheets made from non-slippery material, like cotton and wool. Keep a lamp, phone and flashlight near the bed so they can easily be found in the dark. Finally, eliminate floor clutter and install a nightlight between the bedroom and bathroom. Reduce bathroom slip-and-trip hazards by installing grab bars on bathroom walls and placing a slip-resistant rug adjacent to the bathtub for safe exit and entry. Place a rubber mat or nonskid adhesive strips inside the tub for stabilized bathing. A raised toilet seat or seat with armrests can be helpful, as well. Keep common areas safe by arranging furniture so that there is plenty of room to move in, out and within the room. Keep pathways free of clutter including plants, cords, footrests and magazine racks. Repair loose floorboards or tile, and always secure area rugs with slip-resistant backing. Bright, easily accessible lights are a must. In the kitchen, remove throw rugs and always clean up spills as soon as they occur. If light switches are not located at the top and bottom of stairs, install motion-sensor lights that automatically turns on when someone walks by. Handrails on both sides of stairways make it easier to get up and down. For wood and tile steps, add non-slip treads. For carpeted steps, consider replacing patterned or dark carpet with colors that show the edges more clearly. Keep pathways from the house to the driveway and mailbox clear of hazards and well-lit with motion-sensor lights. Cover external entryways and add ramps to replace steps. For homes in cold weather climates with ice and snow, keep a shovel and sidewalk salt next to the door during winter for easy access. In addition to maintaining a clutter-free home free of fall hazards, it’s important for all seniors to wear properly fitting shoes with nonskid soles. Both men and women should avoid heels and always tie shoe laces securely. Instead of walking indoors in stocking feet, wear comfortable shoes or use well-fitting slippers with rubber bottoms.